Groben just covered You Raise Me Up. It was first recoreded by Irish musician Brian Kennedy and was written by Rolf Lovland and Brendan Graham. It was used for 9/11 commemorations and has been widely covered because of the power of the lyrics. Whatever happens, I hope they paid for the rights to this song, or got permission to use the song freely. Otherwise, they can get sued BIG TIME! It's a shame that so many english songs by Jewish writers can't be as good as the secular ones. If only they would actually go for corses in real poetry writing! not just the chorus. the whole song. 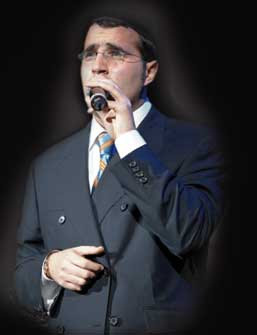 that verse he is singing was originally part of the song but was omitted by groban. it can be heard in the original version by secret garden and brian Kennedy. i mean its becoming excepted .. who cares that he contradicts himself in his other song..
You guys are such morons. A singer is allowed to cover another singer's song. Just because Shwekey sang it doesn't mean he stole it. He's not claiming it as his own. If you had any brains whatsoever, you would have looked into the story and found out that he was at an event and a kid asked him to sing it, so he did. Someone recorded it and put it online. I still haven't heard it, but I would like to. I'm just sick of people not understanding the difference between stealing and covering. Would love to hear the full version...a much quieter and sensitive version. Shwekey has the pipes, but didn't need to use them for this. He is a wonderful human being who is Jewish--as am I--'nuf said. Thanks to all who explained the "covering" of songs--and, I am sure, Josh G would be thrilled to hear him sing it. Hashem bless you, Yaakov.